How many of us use a boxed or bagged pancake mix to make pancakes? I know I do! 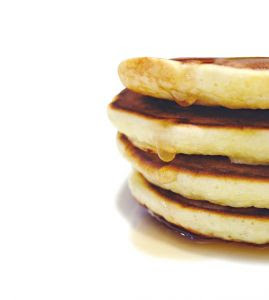 They're quick and easy to use but the pancakes never taste quite as good as the ones you get from a restaurant. Here's a little secret: Many restaurants make their own dry pancake mix and add the wet ingredients just before baking. So here's a mix developed by a restaurant chef that you can make from scratch and store in an airtight container. Whenever you feel like pancakes, add the wet ingredients and. . .Voila! You have your own delicious restaurant-style pancakes in no time for just a fraction of the cost of a prepared mix from the store! Mix flour, baking powder and salt well in a large bowl. Transfer to a four quart plastic container with a tight fitting lid. Store in a cool, dark, dry place until ready to use. To make pancakes (about 20): Put 3 cups of the pancake mix into a bowl; stir in sugar to taste (from 2 Tablespoons to 1/2 cup). Whisk 4 eggs in a medium bowl; whisk in 2 c milk and 1/4 c melted butter into the eggs. Add the dry ingredients; stir until just incorporated. Heat a griddle or skillet over medium heat. Add 1/2 tsp vegetable oil; swirl to coat. Ladle 1/4 c batter for each pancake into the skillet. cook until bubbles appear, about 2 1/2 minutes. Turn pancakes. Cook 1 1/2 to 2 minutes. Repeat with remaining batter. Source: Bill Daley and Christopher Prosperi of Connecticut's Metro Bis restaurant, McClatchey Newpapers.